When young Charlie, Carrie and Paul move to a small village during World War II, they discover their host, Miss Price (Angela Lansbury), is an apprentice witch! Although her early attempts at magic create hilarious results, she successfully casts a traveling spell on an ordinary bedknob, and they fly to the fantastic, animated Isle of Naboombu to find a powerful spell that will save England! 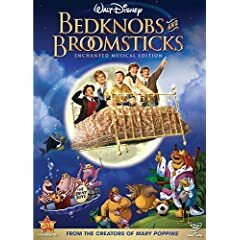 Also starring David Tomlinson (Mary Poppins) and Roddy McDowall, Bedknobs and Broomsticks is a heartwarming adventure viewers will love to revisit! The Wizards of Special Effects – Hosted By Jennifer Stone From Disney’s Wizards of Waverly Place Jennifer Stone, Harper on Disney’s Wizards of Waverly Place, becomes a Special Effects Wizard Apprentice and learns about the academy award winning 1971 special effects in Bedknobs and Broomsticks, then compares them to the special effects magic of her current show Disney’s Wizard’s Of Waverly Place. Music Magic: The Sherman Brothers – Take a look behind the scenes from a musical point of view of Bedknobs and Broomsticks with The Sherman Brothers, Angela Lansbury, and Scott MacQueen. Explores the origins of the songs, including what was deleted and what made it into the final version of the film. below. Last date for entries is September 7, 2009.